Hilly Ridge is a renovated original 'Queenslander' perched on a mountain ridge with spectacular views. It is elegantly appointed and fully self-contained, providing for a private and peaceful experience for couples and families and friends. Hilly Ridge is situated on a private 160 acre rugged bush and cattle grazing property. Located on a mountain range above the classic country town of Boonah, it provides close access to national parks, scenic drives, lakes and wineries. 1 x bedroom with bunks; best suited for children. It is a unique property in the region, perfect for reading a book on the verandahs, dozing in a hammock, sitting by a fire, drinking wine and watching the sun set over the mountain range, and watching the stars. Pets considered. Please contact us to discuss. Basics such as olive oil, tea and instant coffee provided. What a pleasure it was to stay and deal with the owners of the property. They were so accommodating and made our stay absolutely amazing, I could not recommend this property anymore, set in a beautiful location with an amazing view and the place was so clean with plenty of space! 11/10! Beautiful serene property, loved it! The house is just beautiful & has everything you need. The views are absolutely stunning & we would definitely love to visit again! Memorable location. Owner has paid a load of attention to the home's decor. It's a beautiful home with a lot of charm. Good for families! Recently stayed at Hilly Ridge as a treat for my wife. 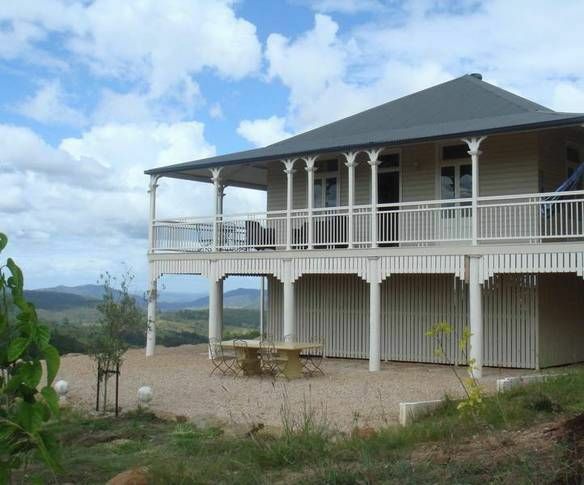 The house is located in the lovely rolling hills about 15 mins out of Boonah. The views from the decks are spectacular, especially in the morning. Wildlife abounds here. The house is well equipped for cooking and also has a magical log fire for winter. Make sure you bring all the essentials though as it's 15 mins or so back to Boonah if you forget anything. All in all I would highly recommend Hilly Ridge for a peaceful stay. We had a magical long weekend with kids and dogs in this gorgeous home. So comfortable. So elegant. Sunsets, panoramas, peace and all the amazing sights of the Scenic Rim nearby. We felt like we were at home...if our home was a magnificent Queenlander in the heart of paradise. We had the most fantastic time at the amazing Hilly Ridge and I could not stop saying how beautiful everything was from the mountain vistas, the house itself, the décor you name it! I just love homesteads like that and the countryside was so exquisite and relaxing, I can see why artists flock to that area to absorb the natural beauty that quite literally surrounds. Milford Hilly Ridge is one of the most beautiful places I have visited including overseas tropical islands. Really loved the beautiful country vistas, wildlife (treated to wallaby sightings at dawn and dusk), the toasty fireplace and fire pit really made it special too. Breakfast every morning on the sun drenched balcony overlooking the mountains, valleys and perfect country vistas was the perfect start to the day.